Product prices and availability are accurate as of 2019-04-22 01:18:29 UTC and are subject to change. Any price and availability information displayed on http://www.amazon.com/ at the time of purchase will apply to the purchase of this product. The Soft Krater Crate is a really handy product to have as a pet retreat for your dog as the crate is collapsable and easy to take on holidays, trips or even to different rooms around your home. The material of the crate provides a dark interior and this may help improve your dog's sleep and melatonin levels! Another great feature of this crate is that the material can be removed from the steel frame and machine washed or it can be easily wiped out and cleaned! We hope this helps in creating a secure and safe sleeping environment for your dog. The NOZTONOZ sof-krate N2 Series is an indoor/outdoor pet home that is easy to carry and sets up in seconds. It is constructed of tight weave, heavy-duty mesh fabric that is durable. The home is washable and has a durable water-resistant base. The rounded corners protect auto interiors and home décor. The home features top, front and side entry doors and is well-ventilated making it appropriate for a Spring/Summer doghouse. 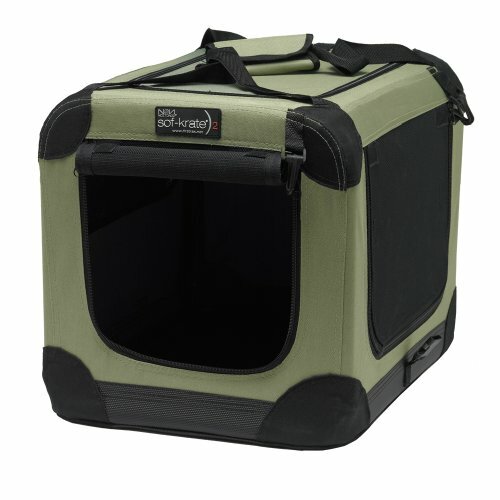 The N2-36 measures 36”L x 24”W x 27”H when assembled and is appropriate for pets up to 70 pounds.